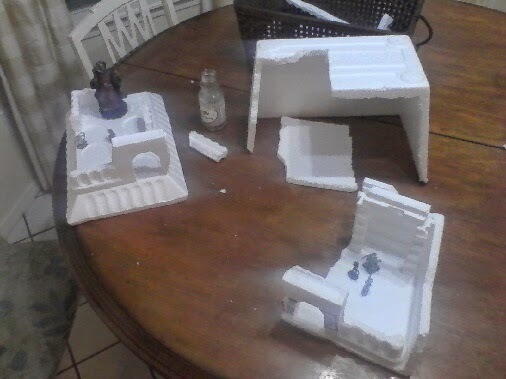 Here are pics of a wargame model I am beginning which I intend to use in a D&D game using the Chainmail combat system. 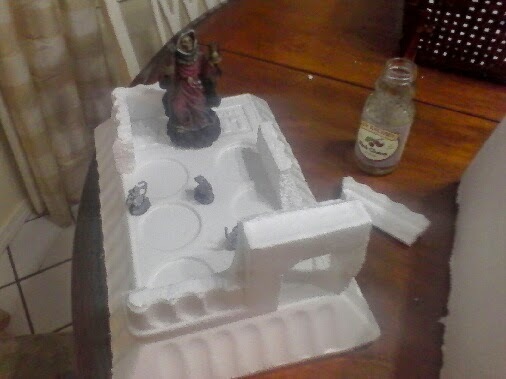 I will be uploading progress pics here at the blog from this humble beginning to...hopefully...a very realistically painted 3D model for D&D miniatures. I was very inspired by one of the mountain top temple ruins in the Skyrim video game by Bethesda Works...what a lush gaming engine! Anyway, I have for some time wanted to construct an open air, mountain top "dungeon" consisting of a series of stonework platforms and temple works connected by dizzying bridges, spiral staircases and crumbling spires. Saan'seriat will consist of several encounter areas of various elevations, nestled in a forbidding mountain range. 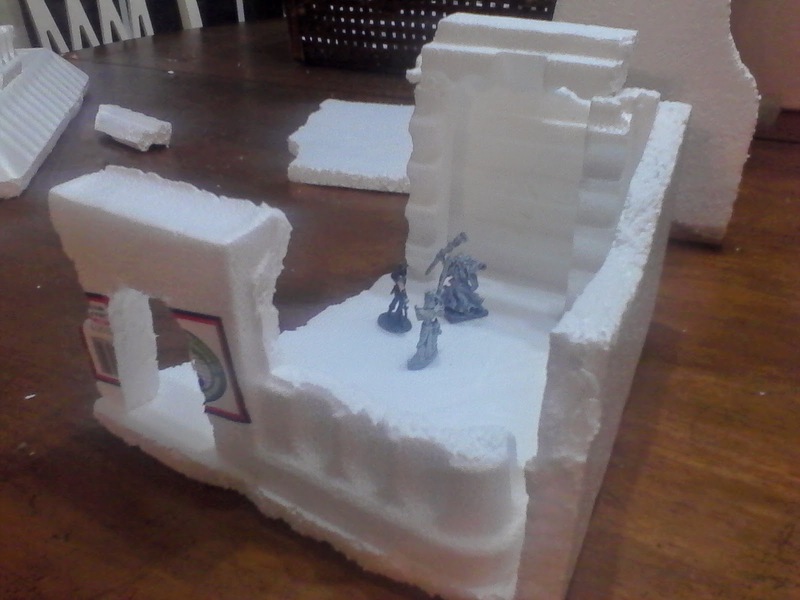 I will be adding these models to papermache mountain footings which should provide for two to three game sessions of dungeon exploration, skirmishes with various Temple guardians, and untold mysteries of the forgotten ruin of a once powerful religion. I will be locating appropriate plastic figurines and toys such as are suitable for painting the same color and texture as the stone works so as to look like grotesque or elegant statuary. These will be affixed to the temple ruins for flavor, and carved faces will adorn the doors and passages of the ancient monument. Aside from whatever weird (and patient) guardians remain at Saan'seriat, there will be the danger of falling and unsteady stone works to give any dwarf nightmares....but of course with treasures that cannot be resisted by brave heroes! I have long wanted to run a D&D game that consisted of 3D models and miniatures that were centered in encounters and skirmishes. My reasoning is that in such a game, where lead-up to the dungeon is summarized to the players and every session of play ends up right at the adventure locale (be it a city, a ruin, or a wilderness), play will progress more quickly, breaks between games will not cause the usual annoying amnesia, and the DM need not focus on anything but the adventure itself. Roleplaying things like character development, buying equipment and leveling will then be handled in a narrative turn that takes place before or after each game session. Everything I needed I found in a single styrofoam cooler, though I will most likely add to it. The mountains will consist of piles of thickly wadded newspapers shaped with masking tape to provide a paper mache frame. The modular platforms will be staged upon these precipices and the highest point will be perhaps three feet off the table when I am finished. The beauty of it all is that this is how I relax after work come nights...it has been a blast so far to build, and I discovered that the grooves built into the cooler provided perfect architectural flavor for Saan'seriat.